Raw Vision is proud to offer some special drawings by celebrated French artiste singulier Ody Saban from her Thème Amoureux. 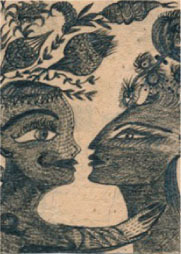 One of the leading self-taught artists working in Europe today, Saban's work has been widely featured in exhibitions, books, catalogues and articles. Her themes of romantic and physical love are her hallmark and she was featured in the recent book Raw Erotica as well as in the exhibition 'Raw Vision 25 Years' at Halle Saint Pierre in Paris. 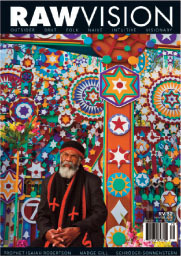 Click here to view works, available now. 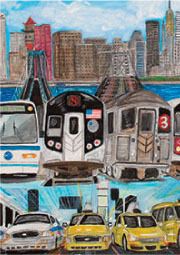 Pure Vision Arts is collaborating with The New York Transit Museum on their upcoming exhibition 'Transit on the Spectrum: The Art of Pure Vision'. Transit themed art by Pure Vision Arts’ artists will be on view as well as a new documentary short based on PVA by Lauryn Siegel and THEY Bklyn. The exhibition will run from January 25 – September 1, 2014, at Boerum PL and Schemerhorn St, Brooklyn, NY 11201. 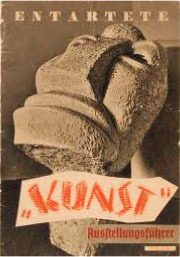 The V&A Museum in London will publish the only surviving full inventory of 'Entartete Kunst' – Degenerate Art – online. The Nazi regime kept records of the 16,558 works of art that were later sold, loaned or destroyed. As well as celebrated names such as Picasso and Van Gogh, the list included many of the artists shown in Hans Prinzhorn’s Artistry of the Insane. Most of these artists were ‘euthenased’ by officials.